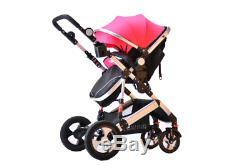 3 in1 Newborn Baby Pram Car Seat. 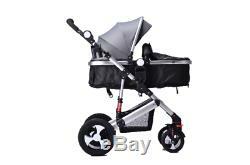 Pushchair Travel System Carrycot Buggy. 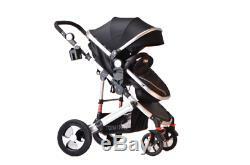 3 in 1 Luxury Travel System Baby Car Seat. 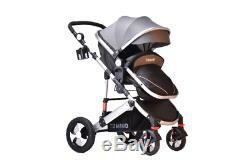 Made with Aluminium, sturdy and lightweight with special production sporty frame and all eyes will be on your baby! 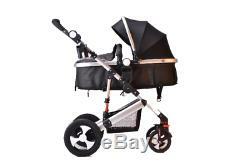 With the special large wheeled baby carriage, the tires now burst and the problems end! Protect your baby with special adjustable extra UV filter shadows! 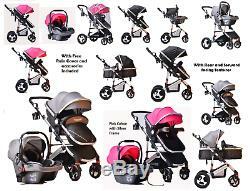 Your baby is very comfortable and comfortable with a two-way system! With all the folding and little space, it enters all the luggage! Robust, lightweight and stylish appearance. Multi functional with special hydration and safety wristband. Two-way operation thanks to its easy-to-install feature. Special pocket and bottle holder. Living unit adjustable to 3 different positions. Special Suspended front steel unbreakable wheels. Anti-vibration detonating filler large rear wheels (steel unbreakable rod). All wheels come out very easily and wear. Front wheels can be easily adjusted in one direction. 360 degree rotatable wheels, easy to use. Living unit that can also be used as a portable. Extra filled matt for baby's first months use (0-6 months). You can easily mount and remove the main unit. Brake / Lock System on Rear Wheels. Easy powerful brake system with remote control. Creating extra canopy with special sun visor awning. You can open ventilation in summer days thanks to special opening side; you can provide thermal insulation by keeping closed on normal days. Fold able feature on the top unit, able to occupy even less space if desired. 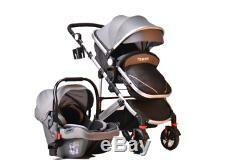 Group 0+ (for babies up to 13 kg). 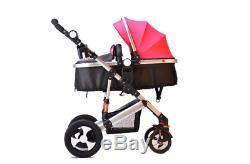 The carrying seat can be used as the main Unit. Head protection design puffy mat. Shock absorbing safety belt pads. Create extra canopy with special sun visor awning.